A: A form of tattooing where pigments are implanted into the dermis of the skin to produce a makeup look or enhance one’s appearance. The focus is typically on the eye area, brows and lips. A: A form of permanent cosmetics. One of the most ancient forms of tattooing, a hand tool is used to produce very fine strokes to mimic hair for the appearance of a fuller eyebrow. Q: Is it a tattoo? A: Yes, Permanent Makeup and Microblading are both forms of tattoos. It can be done by use of a motorized or digital machine or a hand tool through the hand-tap method. A: Permanent Cosmetics are very individual for each person. We do numb the skin with a tropical numbing cream, but it is normal to have some level of discomfort. As an artist you will learn to keep guests comfortable despite the procedure. Q: How often do guests come back? A: They will initially come back for a follow up in 4-6 weeks. After this appointment it is customary to come in every year for a follow up. Q: Do you use tattoo ink? A: No. We use a pigment specifically formulated for Permanent cosmetics. It does not have the level of iron oxide that a traditional tattoo has that causes discoloration and stay power. We use a pigment that fades very naturally into the skin without the raspberry or gray discoloration. Q: Do I have to be licensed to do Permanent Cosmetics and Microblading? A: Yes. Not all states regulate permanent cosmetics, but New Mexico is actually a very proactive state when it comes to safety concerning body art. To do permanent cosmetics or microblading of any kind you must have a permanent cosmetics license. Q: Is this part of the Board of Cosmetologists? A: No. In the state of New Mexico permanent cosmetics and microblaing are part of the Board of Body Art Practitioners. This ensures that all the proper avenues are applied when it comes to safety. As a practitioner you will be dealing with blood and bloodborne pathogens. The Board of Body art is very proactive about the safety of you and those you work on when it comes to the special circumstances associated with body art as opposed to esthetics and cosmetology. Q: How do I get licensed in Permanent Cosmetics and Microblading? 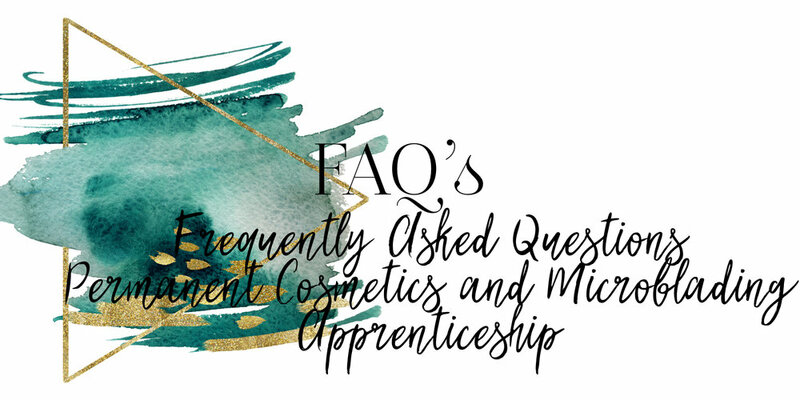 A: To obtain a permanent cosmetics license you must go through a board approved apprenticeship program consisting of 100 hours. Very few programs are currently approved (4 total right now). These programs have met all the requirements for recommended teaching by the board to ensure you receive a well-rounded education. After the apprenticeship is complete and proper paper work is submitted to the board you will be eligible to sit for the state exam and apply to the board for licensure. Q: Can I just do microblaing? A: Good question and probably one of the most frequently asked. No. In the state of New Mexico to do any form of permanent cosmetics, microblading included you do have to have a license in permanent cosmetics which requires that you be taught in all disciplines of the trade including eyeliner, lips, and brows. Q: What about all these out-of-state microblade conferences and trainings? Do they count toward a permanent cosmetic and microblade license? A: This is a big question lately and one we are having to answer a lot. No. These conferences and trainings such as PHI Brows are global companies, but do not get you a NM state license. You will be able to get a certificate from these weekend trainings, but the state of New Mexico does not recognize certificates and practitioners working with just a certificate are doing so unlicensed. The best avenue and the legal avenue is to get a license in permanent cosmetics, build a business, then attend these certification courses as continuing education. Q: What is the cost of an apprenticeship program? A: This is giving you a career and good one at that. The cost of an apprenticeship program with us runs at a total investment $6500. To put this in perspective, an average appointment will bring you $300-$700 depending on where you are working. The investment can be earned back very quickly. Q: What does a business look like in permanent cosmetics? How much can I make? A: This career field has enormous potential for financial freedom. Again, and average appointment can bring in $300-$700 an hour. Not many trades can boast those kind of numbers. This is a trade that, given the talent and training can tremendously impact your business and life in a positive way. A: Yes! You may make payments at any time toward your account. We just ask that the total be paid in full before your scheduled start date. Q: Do you offer scholarships or subsidies? A: We currently do not although this is something we are looking into. Q: How long is the apprenticeship? A: We do a mix of at home computer-based learning and a full work week of one-on-one in our salon. The book work gets you prepared for the test and teaches you the in’s and out’s of skin, color theory, transferable diseases, safety, and more. The time with us will expose you to the real-world experience of taking clients and customizing permanent cosmetics to each guest. This includes measuring, choosing the color, equipment options, sanitation and more. We will also go in depth into building a business in today’s market and what you need to start today. Q: Where is the apprenticeship located? A: Online at sbinm.com and in our Salon, Lorenco’s Salon at 4801 Alameda blvd, Albuquerque, NM. We welcome you to check us out! Q: Where do I start? How do I get into an apprenticeship? A: Fortunately, you are in the right place! Shea Beauty Institute is a board approved NM state program. We currently offer two spots each month for our course. We would love to talk to you more about this and get you started! On our website, sbinm.com you can view dates and submit your deposit to hold your spot. We look forward to working with you!